Ohh, so exciting, my entry into the NSW Quilters Guild challenge won first place!!!! What a happy dance for me. Today I collected my prize, a Pfaff 3.0 select sewing machine, wow! I can't wait to use it. Thank you so much to Pfaff for your kind donation. The challenge was to make a quilt 50cm x 70cm with the theme Coast and Country. 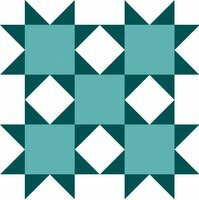 I got so inspired by this theme, abosulute loved making the quilt, and was so pleased with the results, so I was just so thrilled about it winning. 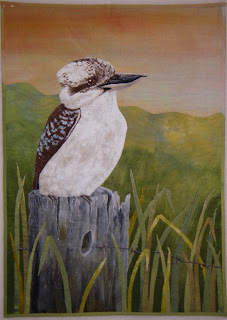 It's called "The Sentinel" and yes, another Aussie Bird, this time the kookaburra. If you want to see all the entries, check them out on the Guild's blogsite. Congratulations Bernardine! The kookaburra is gorgeous. Well - Wow hardly covers it! Congrats and what a wonderful piece. Your detail is really something. What will you do with the new machine? Will it replace your current one or just be a nice luxury as an extra that maybe does different things from your current one? I have every intention of keeping this machine, after all, a gal can never have too many sewing machines, can she??? Congratulations, well deserved. You seem to have a thing for birds and have done the sentinel and others beautifully. Congratulations Bernadine - he is truely beautiful and a well deserved win. congratulations on your win, well done and I hope you enjoy your new toy. Sorry I am a little late with my congratulations. I am way behind in my blog reading -as usual! Well done! love the detail. Congratulations! I can certainly see why you won--the piece is beautiful!